It is 15 years since Paolo Di Canio found himself staring down Fabien Barthez with the chance to eliminate Manchester United from the FA Cup � and for a while the West Ham supporters who sing about that piece of nostalgia every time they visit Old Trafford might have been forgiven for thinking they had another moment to cherish with the same affection. Dimitri Payet�s free-kick was a peach of a goal and another addition to the portfolio of outstanding individual moments that make him an authentic contender for the player-of-the-year honours. The ball arced past David de Gea with an almost implausible amount of curl and, at that stage, the 68th minute, it looked like being an extraordinary way to settle an ordinary match and put West Ham into the semi-finals. This time, however, the home team spared themselves from another harrowing result and in the process headed off another wave of scrutiny about Louis van Gaal�s methods. Marouane Fellaini, suffering his own personal ordeal, was taken off to loud, callous cheers. Marcus Rashford was also removed and, if nothing else, Van Gaal could argue that his substitutions coincided with the burst of pressure that eventually led to Anthony Martial�s equaliser, with only seven minutes of normal time to play. The tie will go a replay � the last FA Cup match to be staged at Upton Park � and, although Van Gaal was too proud to admit as much, there must be an element of relief for the Dutchman, given this was another occasion when his team flickered only sporadically. They did not manage a shot on target before the interval, which has become a recurring theme this season, and Van Gaal talked about them being jaded after the Europa League tie against Liverpool. In those circumstances he could praise his team for their durability in the second half but their improvement does not alter the fact that West Ham had the better chances overall, particularly in the first half when Emmanuel Emenike fired one shot wide and then headed an even better one straight into De Gea�s arms. Slaven Bilic complained afterwards about the way Bastian Schweinsteiger, Fellaini�s replacement, impeded West Ham�s goalkeeper, Darren Randolph, in the buildup to Martial�s equaliser. Ander Herrera had lifted a cross to the far post and it was Schweinsteiger�s considerable backside that prevented Randolph from moving over to the right area of his goal. Diafra Sakho, the nearest West Ham player, is not a defender by trade and Martial took full advantage, nipping ahead of his opponent and adjusting his body shape to turn in the ball from close range. Bilic had a reasonable grievance but, equally, it would not have felt entirely satisfactory if Payet�s free-kick had won the tie bearing in mind what preceded it four minutes earlier � and a controversy that needed television replays before it became clear where the guilt lay. Payet had flicked the ball one side of Fellaini, run round the other and darted inside the penalty area before going down as Marcos Rojo came to challenge him. The referee, Martin Atkinson, waved away the penalty appeals and the replays confirmed it was a self-made fall on the part of the Frenchman. As dives go, it was a fairly convincing one, too, and Bilic was going too far when he argued, vehemently, that it was a penalty and made the unusual offer to �defend my point in Cambridge,� presumably thinking the university is where football managers swear on oath. Payet is a thrilling player but it was difficult not to come away with the feeling that Bilic was being terribly one-eyed. Payet had already been booked for a foul and, by rights, ought to have been shown a second yellow card that would have meant West Ham playing almost half an hour with 10 men. Atkinson did not give either a penalty or a card, which left the impression that the official really did not know what had happened. 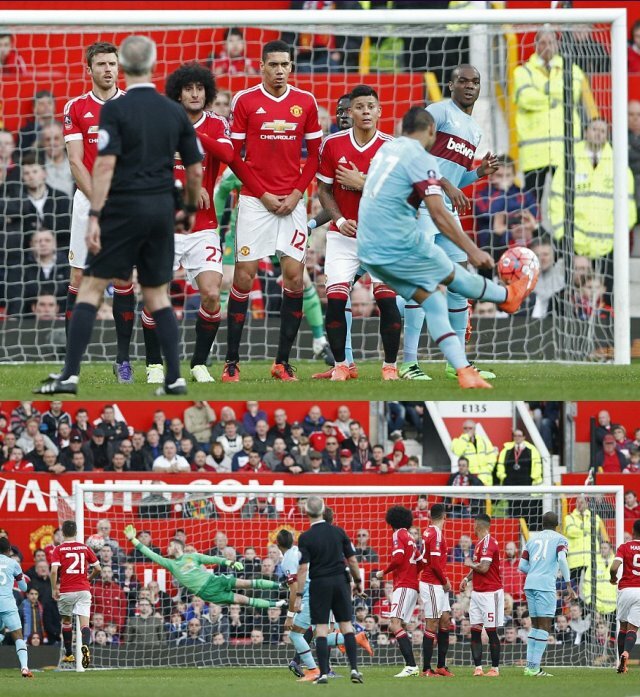 The referee had a bewildering afternoon and that reprieve threatened serious ramifications for the home team when Daley Blind gave away the free-kick, almost 30 yards out, that was followed by Payet�s swirling right-foot shot starting off to the right and then curving inwards to find a way past De Gea, off the inside of the post. Once again the lack of speed and penetration must have been alarming for the Old Trafford crowd but Van Gaal�s players did show perseverance and, more than anything, they never panicked even when they were losing and heading towards another sizeable inquest. As well as Schweinsteiger, Memphis Depay was also brought on in the 75th minute. There was no choice really but for the home side to start playing with more ambition but even after Martial�s goal they stuttered to the final whistle, with West Ham forcing a succession of late corners and De Gea turning away Michail Antonio�s low drive.